Again Where do i begin with this madness.. This was going to be my 4th time attempting this race…. Also i think this race calls you back………..!!!!!!! Why…………..!!!!!! on a Saturday she regretted that comment……..!!!!!! didn’t go down well with the men in my head & also as it would be my 3rd year in a row & putting my body through the early mornings was not too appealing to me…. in rain on dark cold Sunday mornings.. Sure Matt wasn’t bad company….. The months seemed to pass quickly & roll on May 24th the day i would be flying out. up a few months ago so he was coming to La Santa with myself & Matt..
on the road out & thats a story i’ll let Anthony tell……. This year they changed the bike course & from the very start it was climbing climbing..
roll which i was so looking forward too instead of bars & gels…. We met all the Supporters in Teguise (Leila, Shane & Ciat) & they were brilliant with Pulse & Irish flags screaming. Had met Kim Alex Joanna & Jonny earlier & all i can say is Thanks your support on the bike is amazing & its a massive confidence booster when you see everyone..
of these which surprised me as he was flying when I last saw him so I was wondering why I was so close as i was not going any faster… To my surprise i caught up with Matt & as passing him i asked was he ok as he did look pretty shook & his answer was i’m Bo****ed as he had no energy drink left so as Matt will tell you “I SAVED HIS LIFE” & i gave him my drink & some Jelly Babies… I’ll probably never let him forget this & we had a good laugh at this later the next day….. Finally home from the bike & in reality i was hoping for a 6hr 30min bike but the new course was not going to let that happen so 7hr’s 3mins later finally off the bike & the baking sun. Eventually after walking Aid stations & plodding along & i was on my way home..
Met Vincent & Matt in the tent having food & a drink & not long after Brian & Anthony arrived & brilliant to know we had all finished…. That’s it my 4th Lanzarote done & my in total my 6th. If i had been told that 10 years ago when i started this madness i would have peeded myself laughing at you…. Its so addictive.. 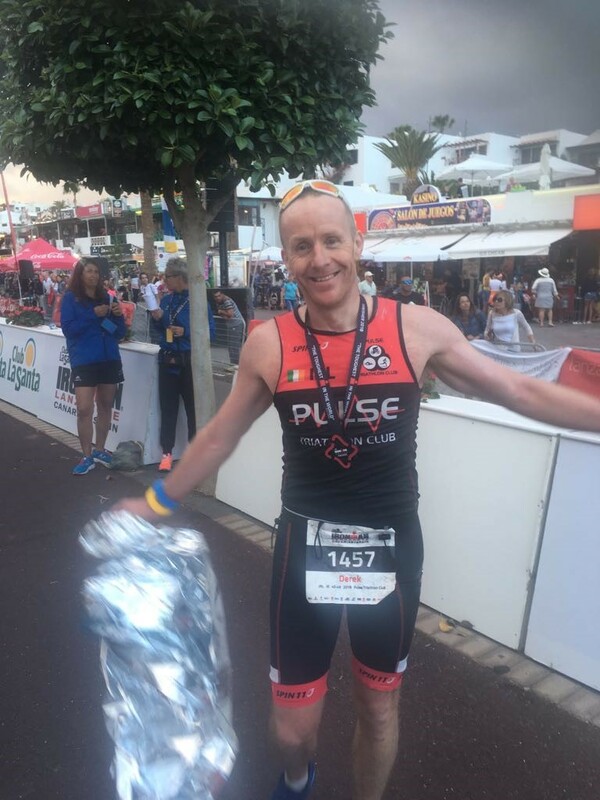 If your thinking doing an Ironman Do it… If your thinking go doing Lanzarote “DO IT” you’ll be back..
Will i go back hell yes even if it kills me i want that bloody 5th medal…. Next year no.. (Maybe Cork….) 2020 for my 50th sounds like a plan & 16hrs 59mins 59secs will do then..
To everyone racing Austria & other races in the coming months remember keep smiling believe me it works…….. Never give up……. I’m off now to regain some extra weight I’m missing…….